In the 1930s and into 1940, the US Navy employed a color marking scheme to enable pilots and ground observers to quickly identify any given aircraft. This involved a combination of colors and letters & numbers. For a look at the standard airframe colors used prior to WWII, refer to the Quarter Master 3-1 color tables. Each squadron was divided into six sections, each section having three aircraft apiece. Each section was assigned its own color. That color was in the fuselage band, the cowl colors and the upper wing chevron. The entire cowl and fuselage bands are in color for the respective section leaders. 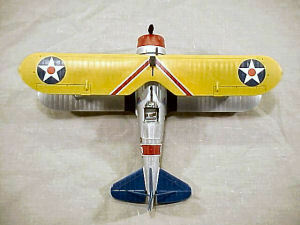 The top half of the cowl received the color for the second aircraft in the section, and only the bottom half in color for the third aircraft. Note that while all three members of the section had the over-wing chevron, only the section leaders had the fuselage band. On the side of each aircraft was number-letter-number code which indicated the squadron, type of squadron, and assignment in that squadron, respectively. For example, 4-F-1 was the squadron commanders aircraft for Fighting Four (VF-4). A 6-S-4 would indicate the second section leader for Scouting Six (VS-6). Aircraft belonging to the squadron commander or section leaders (aircraft 1, 4, 7, 10, 13, and 16) had a colored fuselage band. The number-letter-number identifier would be centered on that color stripe. In the late 1930s, squadron numbers were changed as squadrons were moved between aircraft carriers, so you'll need to do some homework as to which unit shield belongs to which squadron at any given time.